For the first time, Congress has passed a War Powers Resolution to stop U.S. involvement in a foreign conflict the commander-in-chief has engaged in, with the House voting 247-175 today to halt U.S. support for a Saudi- and Emirati-led campaign in Yemen. The Senate passed the bill on March 13, in a major rebuke for President Donald Trump's administration. With the House also now passing the bill, it will be sent to President Trump's desk where it is expected he will veto the bill. It would be only the second veto of his presidency. Under the constitution, Congress has the authority to declare war, but it has never used the War Powers Act of 1973 to pull back American forces from a conflict. The bill is a pointed message to Trump regarding his close relationship with Saudi Arabia, even in the wake of the murder of Jamal Khashoggi, a dissident journalist residing in the United States. "The president will have to face the reality that Congress is no longer going to ignore its constitutional obligations when it comes to foreign policy," Chairman of the House Foreign Affairs Committee Eliot Engel, D-N.Y., said Thursday. Congress is not expected to override Trump's veto, lacking the necessary two-thirds majority in the House and Senate. The conflict in Yemen has been ongoing for five years, killing thousands and triggering a massive famine. The United Nations described the situation in Yemen as the world's most severe humanitarian crisis. Beginning under the Obama administration, the U.S. has provided military support for Saudi Arabia, the United Arab Emirates and their coalition backing the internationally recognized government of Yemen, a country of more than 28 million people on the southwestern corner of the Arabian Peninsula, which was on the brink of famine after years of conflict. 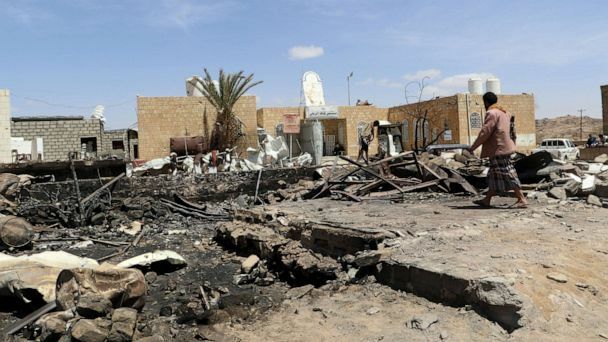 The coalition is fighting the Houthis, a militant group that took over the capital and has increasingly been backed by Iran in their fight to control the country. That assistance has included midair refuels for coalition warplanes, training and advising for troops and on aerial targets, selling weapons and ammunition and sharing intelligence. While the Pentagon announced the midair refuels ended in Nov. 2018, the other activities have continued. A bipartisan group of senators have said that involvement is "unconstitutional, unjustified, and ultimately immoral." "We're literally telling the Saudis what to bomb, what to hit, and what and who to take out," said Sen. Mike Lee, R-Utah, one of the authors of the resolution, which gained support from outrage over the killing of Khashoggi and Trump's continued defense of Saudi Arabia's young crown prince, Muhammad bin Salman. ABC News's Conor Finnegan and Mariam Khan contributed to this report.